イメージ画像： Photo by hirotomo t Some Rights Reserved. Chiyoda Manufacturing Co., a Japanese construction machinery maker in Kagawa Prefecture, on Shikoku Island, announced on July 31, 2013, the launch of its "udon power generation" equipment that generates electricity using biogas, with the principle element being methane gas extracted from waste udon noodles, a traditional Japanese noodle made from wheat flour. The total annual energy production is expected to be 180,000 kilowatt-hours, enough to power 50 households. 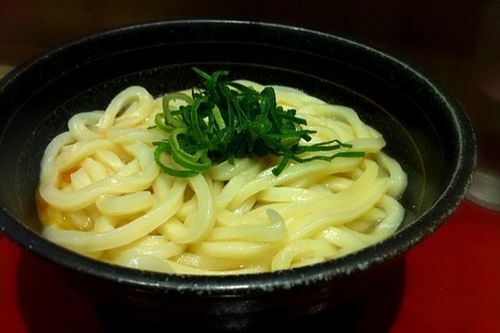 Besides producing biomass ethanol from the waste udon noodles collected from noodle companies in Kagawa, the company has also been looking for an effective use of the materials leftover from the bio-ethanol production process. The plant daily uses 1.5 tons of waste udon noodles and 1 ton of raw food waste collected from restaurants as fuel. Keeping a fermenting tank with the materials warm at 37 degrees Celsius produces the methane gas, which when combusted drives turbines to generate electricity. The company is planning a build-to-order business of producing biogas generation plants based on this waste udon noodle power generation pilot project.